This electronic device will help you make important decisions (or not). While it is deciding the solution to your problem it will convince you how difficult it really is by a painful growling noise - or maybe this is normal when you have to think! 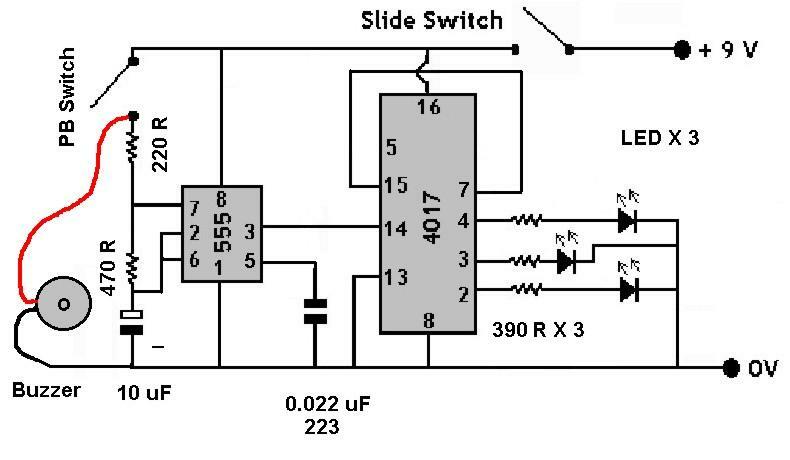 Once the push button is pressed, the circuit uses a 555 Timer in a astable (free running multivibrator) fashion. The mathematics indicate that we should be getting a square wave signal at a frequency of around 124 Hz ( cycles per second) see 555 Worksheet. This signal is fed into the4017 Decade Counter which counts 0 - 1 -2 - RESET. Where RESET is an instantaneous process that sets the counter to 0. For all purposes, the count is 0 - 1 - 2 - 0 - 1 - 2 .............. This counting sequence is produced at pins 2, 3 and 4 of the 4017 . We have assigned pin 2 as NO, pin 3 as MAYBE and pin 4 as YES. The output from the 4017 is passed through 390 ohm resistors to limit the current (protect the 4017) before passing through the coloured LED's to 0V. The push button also supplies current to the buzzer making the noise while it decides. When the push button is released the 555 stops the signal and the 4017 displays the current count YES, NO or MAYBE. 1. Check the PC Board for damage or breaks in the tracks. A CdS Circuit Tester is ideal, or use a continuity tester mode on a multimeter. Repair any damaged tracks. 2. Push the IC sockets into their holes. One has 8 pins, the other 16. The pads on the board will match the legs. Note that there is a notch in one end of the sockets. On the layout sheet there is an instruction about the locating DOT of each IC. If you turn the IC sockets so the notch is where the locating dot is to go, then you will be saved a bit of thinking later when you are ready to push the ICs. into place. Push the sockets right down to the board. It is strongly recommended that you solder the sockets in place right away. See Soldering Technique . Any spreading of solder across to the fine tracks between the pads will prevent the project from working. 3. Identify the resistors by their colour bands See Resistors , and check with a multimeter. Bend the legs to match their holes and mount them to the board. Spread the legs on the other side to hold them in place. They may be soldered if convenient. 4. The polyester capacitor (greencap) can be inserted. They are not polarised so can go any way round. 5. The electrolytic capacitor is polarised. The negative stripe on the capacitor shows the negative leg. 6. The LED's are polarised. Insert them in the correct polarity and colour placement. The A leg is longer. 7. The Piezo transducer has Red (+ ve) and Black (-ve) leads. The board is marked for correct connections. The holes in the board at these points are larger to take the pins in the Kit. This makes termination of the wires much easier. 8. Remove the ICs from their anti-stat cases and identify them - 8 & 16 legs. You will find that the legs are spread too wide to fit easily into their sockets, so hold one set of legs sideways on a flat surface and press down to bend them inwards a little. Follow with the other side. Offer the IC to its socket and check that the legs have been bent in enough to slide into the socket. Look for the locating DOT and turn the IC to match the sheet. Push it firmly into place. Repeat the process for the other IC. 9. Offer the holder into the two holes and push home. Note the battery holder is inserted from the track side of the PCB. Apply the soldering iron to the legs in turn until you have pushed the holder down close to the board. Next, fuse the solder to both pads and legs to form a good contact. 10. Attach the switches in their respective positions. Insert a bettery and test the project. Generally the unit will work right away. If it refuses then you must check locations, values, and polarity of all components against the layout sheet. If these check out then remove the battery holder and inspect all soldered joints. Re-solder any that look suspicious, in fact you could touch each joint with a hot iron to eliminate any soldering problems.